Pradipta is a business leader with over three decades of experience in managing large Indian businesses as well as British, American, and Japanese Joint Venture companies in India. He pioneered India’s foray into modern organized retailing as well as early digital media and e-commerce. 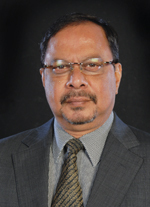 He has experience in managing businesses in IT, Telecom, Entertainment, Pharmaceuticals and Biotech Businesses. He sits in the board of 20 publicly listed as well as private companies in India, Sri Lanka, Japan, China, UK and USA. Pradipta has led Industry and Businesses of Southern India by Chairing Confederation of Indian Industries (CII). The CII members represent about 50 per cent of India’s businesses and industries (www.cii.in). At the national level, Pradipta significantly contributes to assisting industries and government in policy formulation by being members of CII’s National Committees on affirmative action, ethics and governance and corporate social responsibility. Pradipta co-founded Coaching Foundation India Limited (www.cfi.co.in) that pioneers coaching of entrepreneurs and business leaders, as well as Chennai Business School Limited (www.cbs.org.in) that assists young professionals to study management post-graduation in important industry verticals. Pradipta also assists and coaches a large number of first-time CEOs and young entrepreneurs to succeed in their businesses. He co-authored India’s Global Power Houses (2009). He did his under-graduation in Chemical Engineering and Management at Bombay University and Harvard Business School. He was invited to be a Fellow of Chartered Management Institute, UK, and was president of Madras Management Association. Pradipta travels extensively around the world and represents India in many global forums and conferences.